This might be called as Toyota’s way to celebrate its 40th anniversary, though it wasn’t intended to. Release of Toyota FT-1 Sports Car Concept 2014 fell right in the lap of time when it was officially unveiled at 2014 Detroit Auto Show. Hearing the concept name from the company they say, FT mean Future Toyota while 1 signifies ultimate. 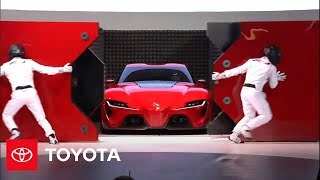 So finally deriving company’s expectations and work level form the name Toyota FT-1 Sports Car Concept we can say it will come with lot many features which a usual car lover usually dream to have. Let us have a descriptive look at the entire model. Interior of Toyota FT 1 Sports Car Concept 2014 features high-end sports car qualities. Equipped with composite seats and a heads up display interior is no where behind in terms of technology and comfort. Right in front of seats is mounted an F1 inspired multi function steering wheel. Entire interior is driver oriented to give him best experience while riding this to an extent 2000GT inspired model. Black interior at some points get contrasting red to give some sporty look with shining pedals adding to the gleam in their unique manner. Flat bottom steering wheel portrays dual color with both sides carrying red and rest (top and bottom) of it in black. Exterior of Toyota F1 Sports Car Concept 2014 is a fine example portraying curved muscular body defined by ‘function-sculpting’ design language. Talking about the front fascia large air inlets, ducting and vents not just monitor and execute the proper airflow to engine but also add to aggressive looks of FT 1 Sports Car Concept 2014. To add some additional downforce a retractable rear wing is added which deploys and tilts forward to execute its purpose of integration. In all we found the entire exterior of FT 1 Sports Car Concept cool with its red and black body and aggressive parts. There is no word from the company’s side in context to the performance delivered by Toyota FT 1 Sports Car Concept 2014 but looking at its aggressive body style and sporty interior, including the F1 inspired steering wheel, speculations are taking figures to great heights with every passing day. It is anticipated that FT 1 Sports Car Concept will be competing with BMW Vision Gran Tourismo and Mercedes AMG Vision Gran Tourismo Concept to prove its mark.